SM Duty Free is the concept of ‘Smart Shopping, Good Memories’. We will be at the center of a worldwide duty free industry’s innovation as the No. 1 for the customer satisfaction and global hidden champion for duty free specialty. 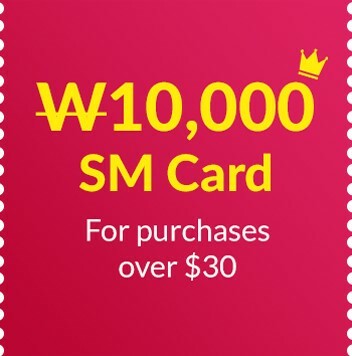 SM Duty Free will present special items that only can be found in the Republic of Korea to our customers, and create a new paradigm for duty free shopping in the Republic of Korea as a meeting of the K-Culture and Tour. Starting with the GRAND OPEN at the Incheon Int’ Airport from Nov 1st 2015, we are impressing our customers with the new and unforgettable shopping that they have never felt before through luxury goods store loved by travellers and the best Korea brands that are unique and high-class. • Up to 40000 Won discount! Use a coupon for each purchase amount when making payment. • Additional discount coupons that are already used cannot be refunded or re-issued when cancelling purchase. • This card cannot be exchanged for cash or sold. • Any alteration(s) on the ticket will not be accepted by Changi Recommends and the appointed merchant.